SAN DIMAS – Bonita Unified students wowed parents and staff with colorful artwork depicting inspirational figures: an orange cat that sees a ferocious lion in its reflection; a pair of firefighters battling an intense blaze; mom and dad dressed up as superheroes. 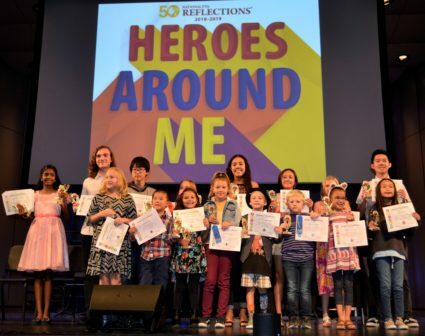 For over 50 years, the National PTA’s Reflections Art Program has provided public school students with the opportunity to submit original works of art in six categories: dance choreography, film, literature, music, photography and visual arts. Bonita Unified’s Award of Excellence winners will advance to the PTA’s First District Competition in November. From there, student winners will advance to regional, state and national contests. Rakshitha Akkala, a sixth-grader at Ramona Middle School, won Award of Excellences in literature, music and photography. Akkala submitted a creative essay titled “My Imagination,” a piano piece titled “Heroes Around Me,” and a photo titled “Babies are Heroes,” which shows a pair of infants playing in a field. 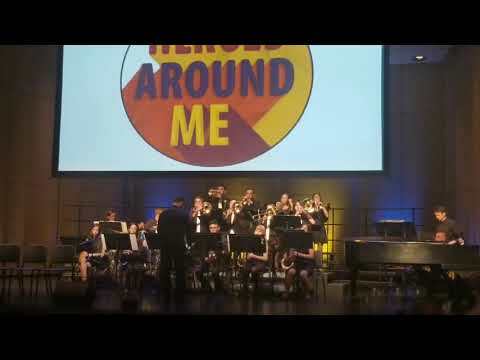 The ceremony featured Principal Ji Wang as the MC, as well as musical performances by Ramona Middle School’s Troubadour choir and the San Dimas High School Jazz Band. BONITA_REFLECTIONS: Bonita Unified’s PTA Reflections Award of Excellence winners are recognized by parents and staff at the Bonita Unified District Awards Ceremony on Oct. 17. Bonita Unified’s PTA Reflections Award of Excellence winners are recognized by parents and staff at the Bonita Unified District Awards Ceremony on Oct. 17.